Credit Union Fund Management Company Christmas party at the Spanish Court Hotel in New Kingston on Friday, December 13, 2013. Official opening of Cellairis Store under the theme "Fashion Meets Mobile", held at Lower Manor Park Plaza on Wednesday night December 18, 2013. St. Andrew Justice of the Peace Swearing-In Ceremony on December 14, 2013. Tessanne Chin victory celebrations in Half Way Tree square, on Tuesday night December 17, 2013. Kingston Kitchen presents Christmas Grand Market, held at Hope Gardens, Old Hope Road on Saturday night December 14, 2013. TVJ's All Together Sing Grand Finals, held at TVJ Studios, Lyndhurst Road on Sunday night December 8, 2013. AMCHAM Digicel Christmas luncheon EXTRAVAGANZA at the Jamaica Pegasus Hotel on Thursday, December 5, 2013. Sagicor Christmas party at the Famous Night Club, in Portmore on Saturday, December 7, 2013. Copyright © 2017 The Gleaner Company (Media) Limited. 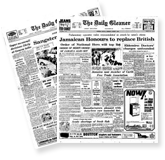 A member of the RJRGLEANER Communications Group. All Rights Reserved. A Gleaner Company (Media) Website. Designed by GoJamaica.